When it comes to seasoning our food, we have an impressive array of spices and flavourings at our disposal. Learning to use them in ways which enhance the flavour of our food is often a process of trial and error. With experience you will achieve a good balance of individual spices and seasonings in recipes; and you will decide according to your own tastes which combinations work best for you. It’s a good rule of thumb to exercise restraint at the start. The large amounts of spices used with abandon in times long gone, often to disguise the taste of foods, have given way to much more subtle combinations. Salt is one seasoning that we have been encouraged to use less of, especially since it is present already in most packaged and canned foods. In preparing fresh dishes the use of unrefined salt, like rock salt or sea salt, for example, is encouraged because it is saltier and you will use less. No salt at all should be added to the food of young children. 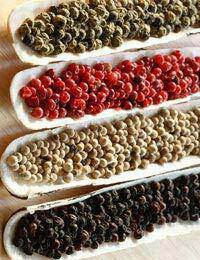 Few spices or flavourings can be more important than pepper. Freshly ground pepper is a common ingredient in most savoury recipes and aromatic black pepper has an immediate effect on the fragrance of a dish. Using whole peppers, whether black or white, means they retain their taste and aroma for a long time and a good pepper mill is a must for the kitchen. Still with the pepper family, capsicums give us the varieties of red and green peppers, chilli, sweet pepper, paprika and cayenne. If using fresh chillies, discard the hot seeds and core, using only the chopped flesh, which gives an authentic flavour to recipes such as curries. If this is not hot enough for your taste, you can add a little chilli powder later - easier to do than to subdue a taste that is too hot. When fresh chillies are unavailable, use whole dried chillies. Crushed, dried chillies, using both skins and seeds, are a good seasoning for chilli con carne, but should be used more sparingly than powdered chillies. Powdered chilli loses its pungency if it is stored for too long. This is the case for most spices and seasonings, so it is a good idea to resist bumper sizes of these ingredients if you are not likely to use them up within a reasonably short time. Cayenne pepper is finer than chilli powder and is more suitable for sprinkling on a finished dish. It is a fiery spice, however, and a pinch or two is all that is required for adding to pates and savoury scones, for example, or for mixing with grated cheese and breadcrumbs to top a baked dish.Tabasco sauce is another chilli product, used in a similar way to cayenne pepper, and it needs only a drop or two in a savoury recipe to be effective. Paprika is made from the ground seeds of sweet peppers. It is not a hot spice like chilli; and it does lose its flavour fast. Whereas English mustard used to be the only one in almost every store cupboard, there are now many varieties. Made from a blend of brown and white mustard seeds, English mustard is still most powerful when made fresh, by mixing the powder with a little cold water and giving it 10-15 minutes for the full flavour to develop. Red or white wine vinegars are the ones to use in low calorie salad dressings and sauces where you don’t want to overwhelm other flavours. Vinegars flavoured with fruit, herbs or spices are readily available, but these are simple to make by immersing herbs, like tarragon, for example, in wine vinegar for a time and straining the liquid if necessary. Powerful malt and distilled vinegars are best used for pickling and chutneys. The most popular spices used as flavourings and seasonings in savoury dishes and Eastern food are good store cupboard staples. They include cinnamon, cardamom, coriander, nutmeg and ginger. One cardamom pod crushed and added to curry gives a delicious flavour. Cinnamon, familiar for its use in puddings and cakes, is now widely used in savoury dishes. Crushed coriander seeds are an aromatic addition to food like curries. Used as a herb, coriander has a very different flavour. Nutmeg, ideally freshly grated, is used in puddings, but also adds subtle flavour to cheese and vegetable dishes and white sauces. Ginger, a very versatile spice, is available fresh, dried, powdered, preserved in syrup and crystallised. Fresh root ginger has become a common ingredient in savoury food like stir fries and can be stored in the freezer wrapped in foil. Preserved ginger is delicious chopped and sprinkled over ice cream or pudding, but it is as a powder that ginger is most commonly used.